I love this sponge cake, it’s soft. Thanks to Rima of Bisous A Toi for translating and sharing this wonderful recipe. I noticed this cake tends to shrink both from the sides and at the top as it cools down, but it didn’t bother me at all. After all, it’s unnoticeable upon frosting. 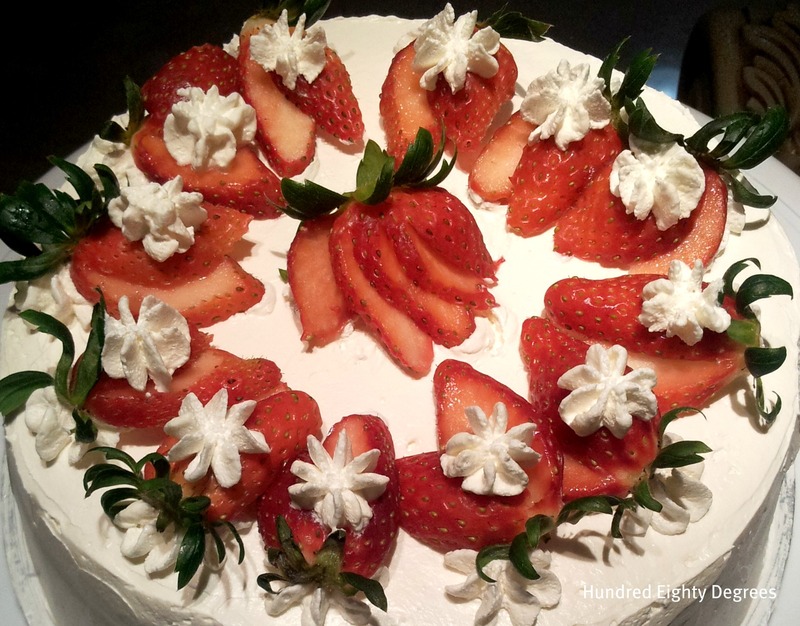 Source : Bisous A Toi “Strawberry Shortcake Royale” with slight modifications. Click here for original recipe. 1. Preheat oven at 160 degrees C. Grease and line 8” round pan. Wrap the bottom of the baking pan with aluminium foil ( I wrapped with 2 layers ). 2. Sift cake flour and corn flour, mix well to combine. Leave aside. 3. Heat butter and milk till warm, do not let it boil. Remove from heat and add in flour mixture. Mix using wooden spatula. 4. Transfer the mixture to a bigger bowl. Add in whole egg, egg yolks and vanilla extract. Mix till smooth. 6. Using rubber spatula, scrape 1/3 egg white mixture into the egg/butter mixture. Fold in gently. Scrape remaining egg white mixture and continue to fold gently until well combine. 7. Pour batter into baking pan and steam-bake for about 45 mins or until the skewer inserted comes out clean. 1. Chill mixing bowl and beaters in the freezer for 10minutes. 2. Put the cold water in a small saucepan. Sprinkle the gelatin over the surface of the water and let it stand for 5 minutes. 3. Place the saucepan over low heat and stir constantly with a wooden spoon just until the gelatin dissolves. Remove the saucepan from the heat and cool to room temperature. 4. Remove mixing bowl and beaters from freezer. In the mixing bowl, combine the whipping cream, sugar, and kahlua or vanilla and whip until slightly thickened. While beating slowly, gradually pour the gelatin into the whipped cream mixture. Then whip the mixture at high speed until slightly stiff. If not use immediately, refrigerate the whipped cream for use later. 1.Trim top off sponge cake layer to make flat surface. 2. Slice the sponge cake horizontally into two layers. 3. Place one sponge layer cut side up on a cake board and lightly brush the surface with sugar syrup. 4. 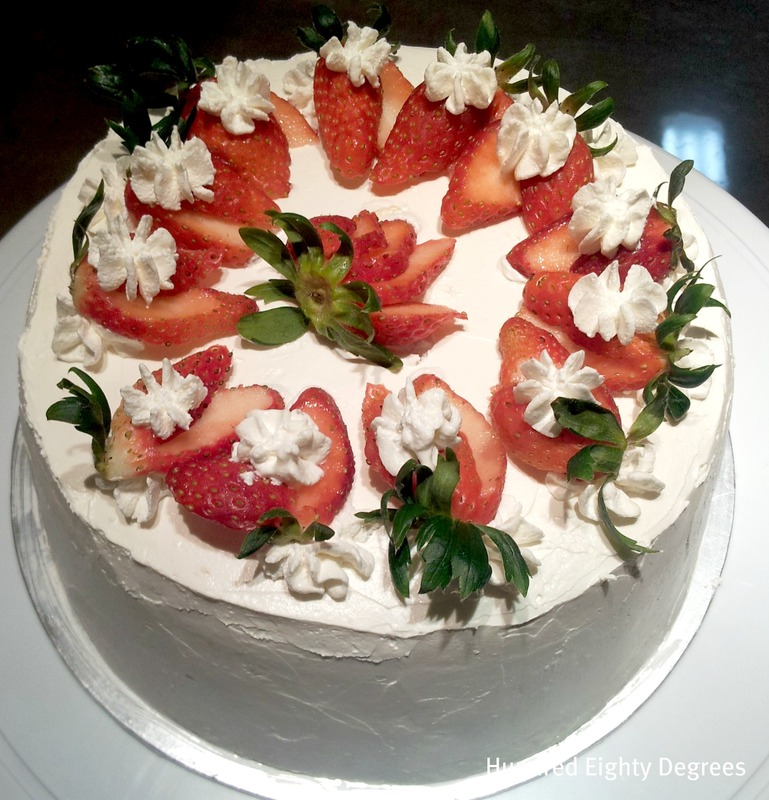 Spread a thin layer of whipped cream over the cake layer, and arrange sliced strawberries over it. Spread whipped cream over the strawberries. 5. Brush the cut-side of 2nd cake layer with sugar syrup, and with the brushed side down, on top of the whipped cream, press gently to make level. 6. Do a crumb coat by frosting a thin layer of whipped cream to seal the cake crumbs. Refrigerate the cake for 15 minutes. 7. 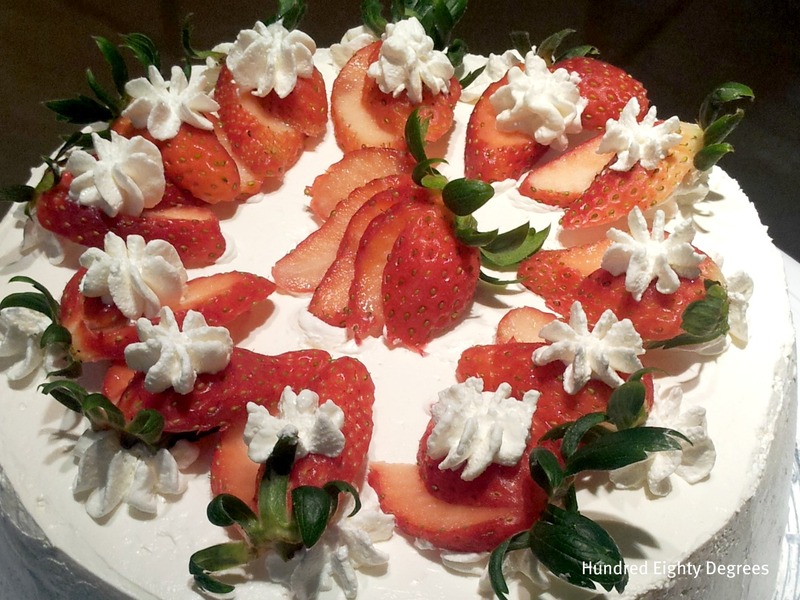 Generously coat the chilled cake with whipped cream, frosting the top of the cake first, follow by the sides. 8. Chill in the fridge for cream to set for an hour or so. Garnish with the reserved strawberries. Decorate as desired. eileen, you shld make her 4 birthday cakes to make up for the non leap year birthday! LOL! i just read your comment in my blog..so nice of you concerning the bake along. Dont worry, do it when you hv time, we will have these bake along twice per month. Hugs! 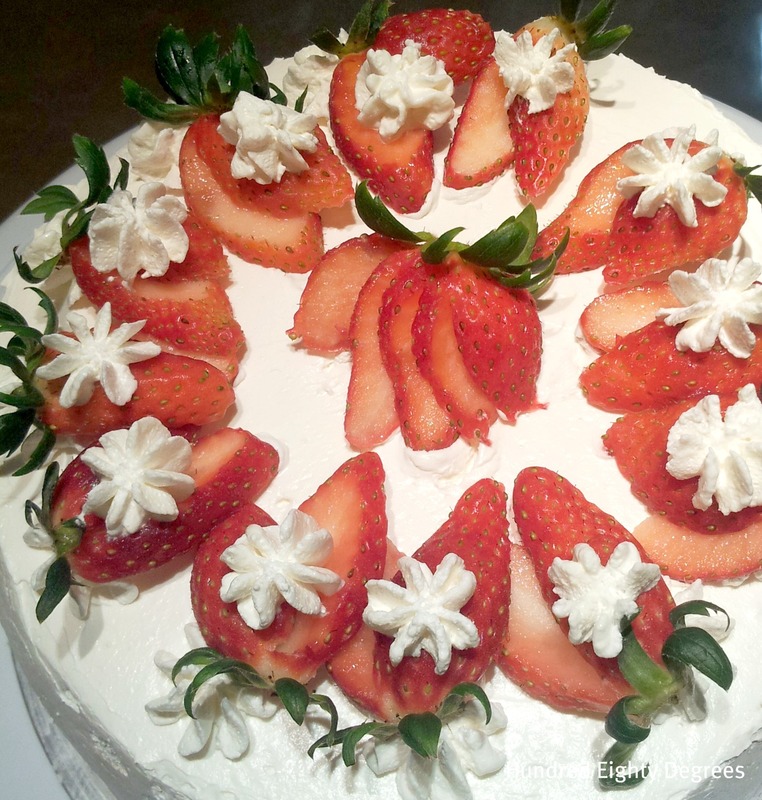 Eileen, your strawberry cake so cute and pretty. 2 thumbs up for you. Amelia, thanks for your compliments. so nice of you to make this special Birthday cake for her, pity them only celebrate Birthday once in every 4 years! Happy Birthday to you friend! It can be good as leap babies age slower than others, haha! Thanks for your wishes.